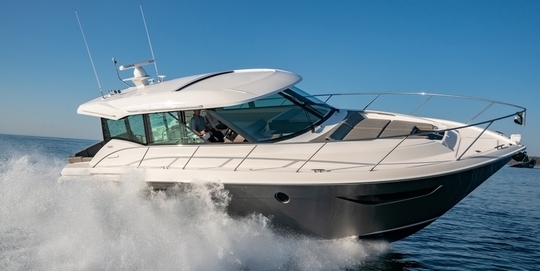 Tiara Yachts takes the Coupe series to the new with the introduction of the 49 model. Tiara first Coupe the 50 introduced in September 2015 defined a new evolution in design, which later was reflected with the introduction of the 39, 44 and 53 models all in the spirit of timeless classic down east lobster boat inspired design, and backed by Volvo’s easy to operate IPS pod drive system. The 49 Coupe builds on the successful momentum of the range and elevates that experience with the introduction of expanded interior space throughout. New Coupe buyers will feel the openness immediately in the single level salon followed by the lower cabins and spacious master. The interior is further enhanced with the introduction of a full suite of hardwood finishes and designer fabrics in tune with summer fashions and trends. The transom showcases a fully integrated swim platform which may be optioned with a hydraulic lift. Entry to the cockpit is via the port side steps through a manual locking stainless steel gate. One of the most exciting changes on the new 49 Coupe is the rear cockpit lounge seat finished in exterior grade Ultraleather which now incorporates a starboard side aft corner to accommodate more guests while entertaining. A port side aft facing seat and high gloss adjustable teak table add to the ambiance of the open air cockpit. The hallmark outdoor/in living spaces of the first Coupe model is prominent in the new 49 with entry into the salon via a cockpit sliding door framed by windows on either side. The galley features both port and starboard include drawer style refrigerator/ freezer, two burner cook-top, microwave/convection oven and storage above and below. Large quartz counter-tops complete the galley space. Step up to salon seating and helm area with its port side U-lounge, convertible to a berth, and starboard love seat. The dual companion helm seat is fully adjustable. Volvo Joystick controls are fully integrated with Garmin electronics and remote. The fully integrated fiberglass hardtop frames large tempered safety glass panes port, starboard and forward providing an unimpeded platform to safely and enjoyably operate the 49. One of the real joys of the Coupe series is the visual access from virtually any point in the salon and cockpit to what really matters when yachting, enjoying the water all around you! The lower master and VIP suites are accessed through a center stairway. The master features a private head and center-line queen pedestal berth with innerspring mattress. Audio visual, storage and hull-side windows make the master a great retreat any time of the day. The VIP shares a day head with the lower atrium but still maintains a private entrance for sleeping. Additional hull side windows allow plenty of natural light carrying the open living theme throughout. The atrium features a port side lounge that may also be used as a berth. The mechanical space and engine room are accessed through the large cockpit floor hatch. Volvo 600hp engines with IPS pod drives power the new Tiara 49 Coupe with top speeds up 31 knots and a cruise of 26 knots.